When in longitudinal directions, heat pipes offer high thermal conductivity. The effective thermal conductivity of heat pipes is between 10 to 1000 times more than pure copper conductivity depending on manufacturing and length factors. When combined with spreaders, they become a powerful tool to dissipate large heat quantities to the location or environment when you can install cooling systems. For optimal performance, the system should work with gravity. In situations where gravity cannot be used, overall performance should be graded. There are many factors influencing performance degradation including working fluid, length, and structure of the pipe with application heat flux. Careful design can minimize performance loss and allow accurate performance prediction. Several limits are governing the theory behind heat pipe. However, capillarity limit is the limiting factor in terrestrial applications. When capillarity capability is inefficient, the insufficient liquid is sent to the evaporator. Dry-out prevents the continuity of the thermodynamics cycle. When the evaporator is below the condenser, heat pipes are most capable. Most pipes use methanol and water as working thermodynamics fluids. Pipes operate in environments with temperatures as low as -40 degrees Celsius while fluids determine the upper limit. An air cooling system can remove heat from the condenser. You will allow for liquid cooling if you enclose the condenser in the cooling jacket. Heat pipes have a lifespan of over 20 years. Because they have no moving part, they are more reliable. They can be bent or flattened to accommodate for special needs of the sink design. Power-handling capability can be affected by forming heat pipes. The inner walls of a heat pipe can be lined with various wick structures. This provides paths for the liquid to travel from the condenser, using the capillary action, to the evaporator. Aluminum heat pipe design and technology is best for this use. 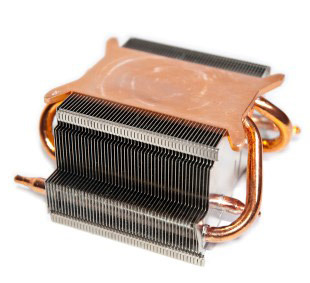 Heat pipe manufacturers can provide advice and project management with turnkey services.